Q. What is the Iowa Watercraft Safety Certificate? A. The Iowa Watercraft Safety Certificate (also known as the Iowa Boating License or boaters license) is proof that you have taken and passed a boating safety course approved by the Iowa Department of Natural Resources. All boaters in Iowa between the ages of 12 and 18 are required to carry a valid watercraft safety certificate when operating on state waters. The Iowa Watercraft Safety Certificate is good for life and does not need to be renewed. Q. Boating License or Watercraft Safety Certificate...is there a difference? A.The watercraft safety certificate is proof that you have successfully completed a boating safety course. The certificate does not expire and does not need to be renewed. Therefore, it is NOT an Iowa Boating License although that's what most people call it since they are used to the term. Q. I do not have a driver's license. Can I still get the Iowa Watercraft Safety Certificate? Q. How can I get my Iowa Watercraft Safety Certificate? Q. Who needs an Iowa boater license? A. A watercraft safety certificate is required for all operators between 12 and 18 years of age who wish to operate a powered vessel on Iowa's waters. For more information please consult the Iowa boating laws and regulations page. A.There is a one-time fee of $29.95 + a $5 state fee paid to BOATERexam.com®. It includes unlimited attempts at the final exam. 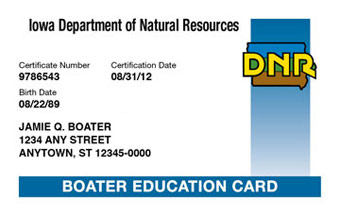 There is also an additional $5 fee—collected after you pass the final exam—for the state issued boater education card. Your card will be mailed to your home within 4-6 weeks. Learn more about BOATERexam.com's Risk-Free Policy.